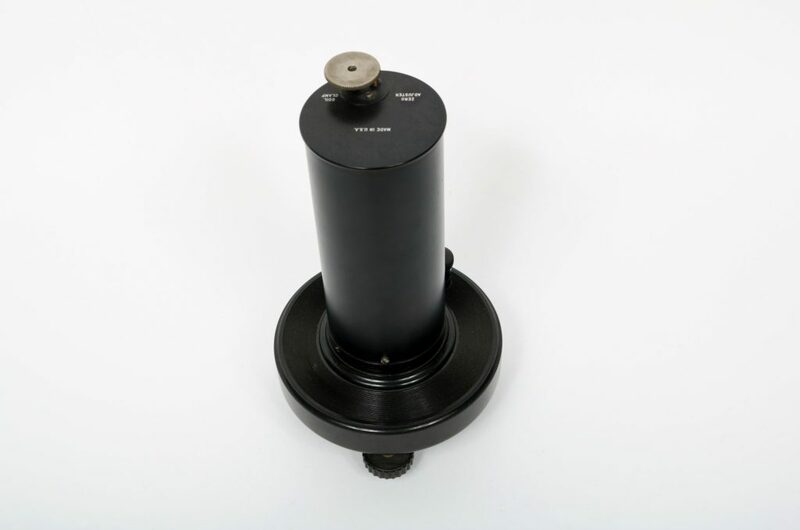 This is a black galvanometer with a cylindrical body. 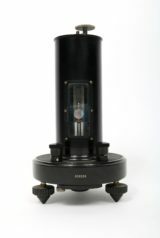 A circular plastic base sits on a tripod of adjustable feet. On top of this there is a cylindrical case with a rectangular window opening on one side. Through this window there is a small round mirror centrally attached to a very fine vertical thread. In front of the cylindrical body there are two contacts with plastic knurled knobs that can be screwed up and down to attach wires. On top of the cylindrical body there are two metal attachments, one a small split cylinder labelled “ZERO ADJUSTER”, the other a knob attached flat with an open hole in the centre, labelled “COIL CLAMP”. 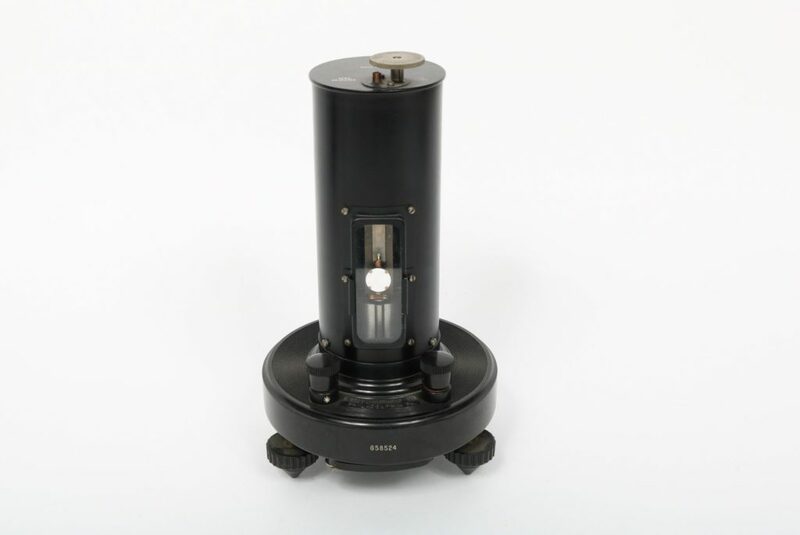 Embossed on the top of the base: “LEEDS & NORTHRUP CO.
Galvanometers detect very small changes in electrical current. 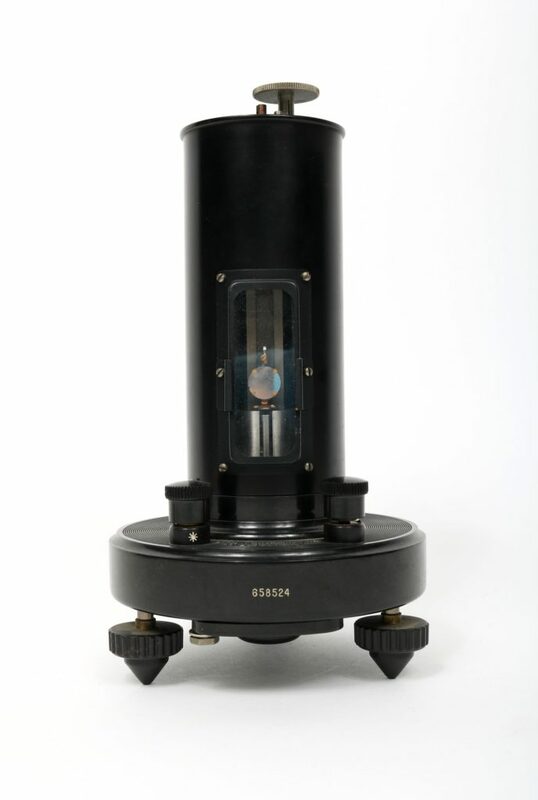 A moving-coil galvanometers do this by having an electrical current running through a coil creates a magnetic field that turns against the field created by a permanent horseshoe magnet. This interaction slightly deflects a small mirror. Shining light at this mirror allows the deflections of the mirror to be projected onto a scale and measured. Excellent: The galvanometer shows few signs of use or damage. The knob on the top of the galvanometer is slightly corroded. An instructional manual can be found here, hosted on the Robert A. Paselk Scientific Instrument Museum (Humboldt State University) page.